Now here's some happy news: the nice people at Sunday Knits are making it easier than ever to get your hands on (and in) some of my mittens. They're now offering kits to make the five patterns of mine (at present) that call for their luxurious yarns. Check them out here. Now it's all over but the knitting. Enjoy. Oooh! I must get my hands in Schnecken. 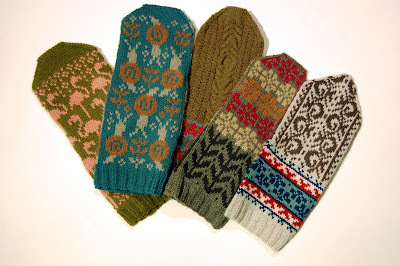 I'm finishing up my first Fair Isle mittens, so I think this would be perfect for my next project. Beautiful work! January 20, 2011 at 5:11 p.m.
Yay! This sure makes things easy and fun! January 20, 2011 at 6:41 p.m.
its a match made in heaven - sunday knits with spillyjane. Lovely. MUST. HAVE. FLAMINGOS. January 20, 2011 at 6:51 p.m. I echo the previous comment. MUST. HAVE. FLAMINGOS. January 20, 2011 at 7:52 p.m.
January 20, 2011 at 8:03 p.m.
January 21, 2011 at 1:06 p.m. The flamingos are great but I LOVE Isadora! January 21, 2011 at 9:02 p.m. I like the one on the right, Zarzuela. January 23, 2011 at 11:33 a.m.
Cheezburger Mittens! You can has!